I spent yesterday canning pasta sauces, sambal oelek, and tomato eggplant relish. We had a big storm blow through but now that there are no trees to fall on the house/garden/truck I pretty much worked through it. While I was canning I was toying with this idea. By the time the last jar was cooling I was ready to gave it a try. You see, the garden is in full swing and we’re getting plenty of eggplant, zucchini and tomatoes. I’ve already harvested the garlic. Sounds like the base for ratatouille, but I’ve done that. Don’t get me wrong, I love ratatouille. But I’ve made it a bunch and wanted to play with some new ideas. 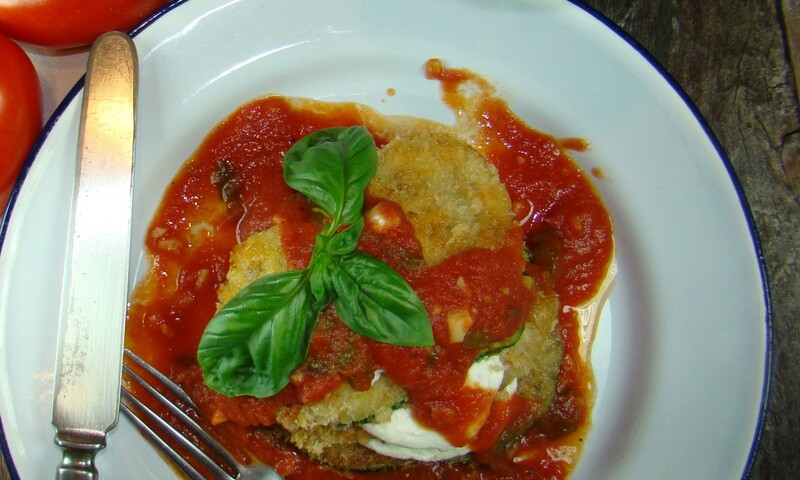 A week or so back I made the eggplant rollatini, and really enjoyed the crisp sheets of pan fried eggplant. I thought what about doing the same with some over grown zucchini? You know the one… hiding under the broad leaves and you don’t find it until it resembles some prehistoric war club. Don’t worry, it happens to all of us! While I normally grate it for bread or fritters, as it was almost the same diameter of the globe eggplant, I decided to give it the same treatment. I didn’t really measure or count so your mileage may vary. I’m sure it’ll be delicious. Oh, and I want a milk goat, and maybe a cow, because with them, this could entirely homemade! – Ah well, one step at a time. By the way, this is served at room temperature, otherwise the whipped cheese will not hold up. 1-2 cups tomato sauce warmed through but not hot – if you must, use jarred. I had some tomatoes, a lot of garlic and some fresh basil which I made into a quick bright fresh sauce. Using a stand mixer, or a hand held mixer or good old plain muscle whip together the goat cheese, heavy cream and herbs until you have a thick whipped creamy cheese – set aside. Rinse the eggplant and zucchini, pat dry. Dip sliced vegetables in the egg wash, shake gently to remove excess, dredge in panko crumbs and pan fry in oil in batches until golden brown – remove cooked slices to paper towel lined cookie sheet – sprinkle a little salt on them as soon as they come out of the pan. Repeat until all the slices are cooked. 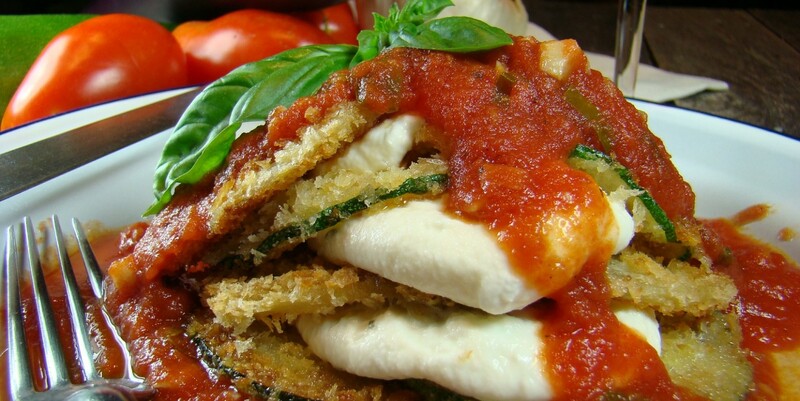 To assemble – spread a small amount of tomato sauce on the plate – add two slices of eggplant, a dollop of herbed cheese, top with two slices of zucchini topped with more cheese, repeat process. Spoon tomato sauce over the top, and garnish with basil sprig. This was as fresh and delicious as it gets. wow that is really what summer food is all about! i have a zucch out there that is getting bigger by the raindrop… sounds like a good candidate for this beautiful recipe! You could use zucchini only and I’m sure it would be great! I was thinking of you and your homemade goat cheese and how awesome it would be to do this entirely from ingrediants sourced on the homestead. I’m glad you enjoyed the rollatini. As a eggplant “lasagna” it will still all be delicious! And this Napoleon is really just an individual portion of what you made, albeit with eggplant and zucchini and goat cheese rather than ricotta. But it’s all good. Well, I don’t have any zucchini but I was just given some eggplant that I didn’t know what to do with…this looks like a good idea though I don’t have any goat cheese…will have to see what I can come up with. Hi becky, you could sub cream cheese or ricotta… I’m sure it would be fine! I’m putting this one on my list of dishes to cook when I have that long-anticipated glut of aubergines, since I don’t have any courgettes. The photos you have used this time are particularly impressive – as one of your FB friends said, just the sort of photo you find in an upmarket Foodie magazine! Are you growing the globe type, because that would work best I think. I’m pretty pleased with the photos this time. Thanks Mark! omg, I am so making it this week! I love the idea, kinda a deconstructed ratatouille! I make ratatouille quite often as well whenever I seem to have an abundance of eggplant, zuchinni, etc. So I’m thrilled to see this!! Love the presentation; its dinner party worthy!! The napoleon not only sounds delicious but it also beautifully plated. Hi Karen! Haven’t heard from you in a while, hope all is OK! It was delicious, but really the subject is so pretty, it makes me look good. Wow.. I’m keeping this in mind, we’ve so many zucchinis coming in at the market. I’ve sliced and fried pieces and sprinkled with cheddar, but this panko takes it to another level.. then add that cheese. Fantastic! I’ve never “whipped” cheese, very cool! Hi Lauren, The goat cheese whipped with heavy cream gives you a light creamy tangy cheesey mixtures that can be piped. I don’t think fresh mozz has the right consistancy or flavor. You could try substituting regular cream cheese that is at room temp. Add some herbs! that would be good… Thanks for stopping by! Just made this dish this past weekend…Delicious! I swapped the eggplant for yellow squash instead (dietary restrictions), but it still amazed me and I will definitely be making this again! Thanks, Dave! Thank you Jenny! Glad you liked it!